Welcome one and all to the final installment of the NXT Spotlight before Takeover: Phoenix, right here at TJRWrestling. We’ve got a loaded card coming this Saturday, and you can read all about that along with my predictions (joined by John Canton too!) right here. We have a few loose ends to tie up before we head to the desert, so let’s just jump right into this week’s episode! We start this week by seeing Ricochet walk towards the arena with a determined look on his face. He’s coming after Johnny Gargano tonight. With that, the Undisputed Era music hits and out walks Adam Cole. He tells Dream to pump the brakes as he walks out with Bobby Fish. He says 2019 will be the year of the Undisputed Era because they will claim every title NXT has to offer. Roddy and Kyle are busy getting ready for their tag title match on Saturday. He & Fish do not have any gold yet, but they don’t like showing up to a party with nothing in hand, so they’re going to have gold very soon. So Velveteen can just dream on. Fish says shame on Dream. The crowd is screaming at Fish to shut up. He says Dream needs to learn to live in reality. 2019 will continue to be their Era and that is Undisputed. Dream says he’s ready to dispute that claim. But only if it’s ok with Adam. Fish gets angry at that and they both charge the ring, but Dream dumps them both to the outside again as he slides out of the ring. K-Tank’s Take: This will of course set up a match later in the night. My guess is they realized Cole and Dream really have nothing to do, and with no real title opportunities coming, why not just do a feud between the two of them? Dream was a full fledged babyface here, for anyone wondering. It’s a shame these two couldn’t get on the Takeover show this Saturday, but I think that’s going to happen from now on with any Takeover. The roster is so loaded and they only have so much space per show. We get a video package hyping up the NXT Women’s Title match at Takeover between Shayna Baszler and Bianca Belair. 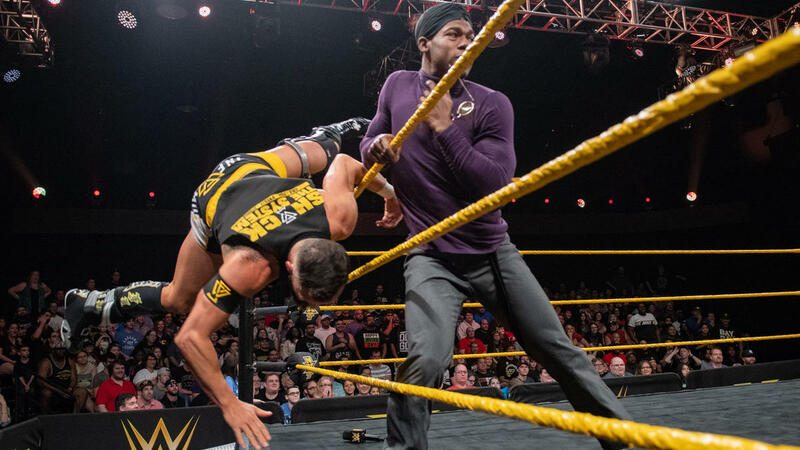 After a commercial break, we get a recap of what took place between Keith Lee and Kassius Ohno last week on TV. Lorcan and Barthel start us off. Barthel with a palm thrust to the throat and gets Lorcan in his corner to stomp a mudhole and then tag in Aichner. Aichner comes in with a tilt-a-whirl backbreaker for a two count and then tags back in Barthel, who continues the attack. They try to double team Lorcan, but he escapes and tags in Burch, who takes out both opponents. He moves out of the way of a Thesz Press from Aichner and then lands a big headbutt on Barthel. He goes to the second rope and hits Aichner with a front dropkick. Lorcan tags back in and they go for their finisher, but Barthel breaks it up. Barthel with White Noise to Burch and then Aichner turns Lorcan inside out with a clothesline. Lorcan caught in the wrong corner again and they’re able to do their rocket launcher into the brain buster from Aichner on Lorcan. Barthel dives through the ropes and takes out Burch as Aichner does a double springboard moonsault on Lorcan for a two count. Awesome sequence there. Aichner and Barthel try their European uppercut/powerbomb combo, but Lorcan rolls through instead and locks on the half crab on Aichner. All 4 men are in the ring everyone is going after everyone until Barthel and Burch are back to the floor. Lorcan wil hard chops to Aichner and then a lariat. He then somersaults over the top rope to take out Barthel and his own partner. Aichner is right behind him though and does a frog splash off the top rope onto all three men on the outside. Aichner gets Lorcan back in the ring and goes for another springboard move, but Lorcan moves and rolls up Aichner, while Burch holds Barthel, and he gets the surprise 3 count after a chaotic match! K-Tank’s Take: Man, that was nuts for the time it had! Aichner is really good and always does something in his matches that make your eyes raise. I’d love to see these guys go at it again and get a few more minutes. I got the assumption that Barthel/Aichner would be on NXTUK from now on, but they’re definitely a welcome addition to the NXT tag division right now. We get a video package to hype up the NXT Title match at Takeover between Tommaso Ciampa and Aleister Black. For those that don’t know, Tanea Brooks is the very attractive Rebel from Impact Wrestling days. As John put it to me, it’s a shame she had to wear less revealing attire tonight. It’s also a shame we didn’t get her splits on the bottom rope entrance. Io and Nova start things off and Io showing off her agility before hitting a dropkick and tagging in Kairi. They double team Nova and then Kairi hits a running Blockbuster. Kairi walks the plank and nails Nova with the running elbow smash. Kairi to the top rope but Brooks distract her. Nova ends up hitting Kairi from behind and tags in Brooks. Brooks with a knee right to the face and then gloats about it. She gets Kairi up for a vertical suplex, but Kairi slides out and then comes off the ropes with a spear. Io gets tagged back in and hits a delayed seated dropkick on Brooks before hitting a 619. Nova comes in the ring and Io hits a springboard front dropkick on both. Kairi tags back in as Io lands a spinebuster on Brooks. Kairi and Io do a cool looking pop up In-Sane Elbow drop and then a double team standing moonsault by Io, which that leads to the three count. After a commercial break, Io and Kairi are doing an interview and they say no one can stop them together. Jessamyn Duke and Marina Shafir show up and tell them not to get too comfortable, because they’re coming after them. K-Tank’s Take: Great to see Kairi back in the ring after her unfortunate illness. Of course, as soon as she comes back, Dakota Kai gets hurt, so we really can’t go back to the 3 on 3 storyline they had with the Horsewomen. Kairi and Io are a natural fit together though and maybe can find a way into the tag team division for the new Women’s title belts that debut at Elimination Chamber. Rushed entrances for both men as the camera came back to ringside halfway through Dream’s. Dream is focused on Cole as the bell rings and Fish is able to take advantage with a couple kicks. Dream finally catches one and sends Fish into the ropes, but Fish drops him with a shoulder tackle. Fish goes off the ropes again and catches Fish with the Dream Valley Driver, but Fish slides out. Dream able to hit a dropkick instead though. Fish catches Dream with a boot in the corner but Dream springboards off the top rope with a clothesline. Fish rolls to the floor before Dream can make a pin attempt. Dream tries to slingshot over the top rope to take out both guys, but they move so Dream just lands on the apron instead. Fish comes on the apron and Dream hits a springboard dropkick. Fish back to the floor and this time Dream comes off the top rope with a double ax handle. Both men back in the ring and trading forearm smashes. Dream with a series of right hands. Cole comes on the apron, which allows Fish to chop block the leg of Dream. He pulls Dream to the floor and does a dragonscrew whip into the barricade. Fish with knee strikes and then goes for a slingshot senton splash. Camera work made it look ok, but it was clear he didn’t come close to hitting Dream with it. Fish focusing on the injured left leg. Fish locks on a half crab on the injured leg. Dream rolls through and escapes. Big knee strikes by Dream and then comes off the second rope with a dropkick for a two count. Dream has the advantage for a minute until Fish kicks out the knee again. Fish comes off the ropes but Dream catches him with a spinebuster. Dream to the top rope and lands a Purple Reignmaker but Fish is able to roll Dream over and then locks on a Knee Bar. Dream comes close to tapping out a couple times, but when he reaches the ropes, Cole is there to pull back on them so he can’t grab it. The ref sees it and threatens to kick Cole out. This allows Dream to come from behind Fish with an O’Connor roll for a two count. Dream rolls through Fish to get him up for the DVD, but he can’t hold the weight, so he just throws Fish to the outside. Fish comes right back in, but runs into the DVD, which this time Dream can hit. Dream back to the top rope and one more Purple Reignmaker and this gets the pin. K-Tank’s Take: Felt like a rushed match from the beginning, but I guess they wanted to get Dream some strong TV time since he hasn’t been on in a while. Good win for him, and as I said earlier, I would expect he vs. Cole to continue now. We go back to last week when The Forgotten Sons attacked The Street Profits after their match. We find out that next week, it’ll be these two teams taking on each other. Also next week, it’ll be Kairi Sane and Io Sharai vs. Jessamyn Duke and Marina Shafir. The North American Champion, Ricochet, comes out to close our show and call out Johnny Gargano. He says Johnny talked all this crap about being better, but then no sooner did he blind side Ricochet with a super kick. The 2019 Gargano is the same as the 2018 Gargano. All Gargano did in 2018 was show his true colors. He’s a liar and deceitful, and the only person he cares about is his miserable self. In 2018, Ricochet showed his true colors too though, when he won the North American Title. He’s the One and Only. He is something that Gargano isn’t, a champion. That cues up Gargano’s music. He comes out and says he knows what Ricochet is trying to do. He’s trying to get his emotions to get the best of Gargano. 2018, Gargano would’ve rushed the ring like a crazy man. 2019 Gargano though, he has a plan. Gargano gets in the ring and they start trading blows anyways. Ricochet with a pump kick to knock Gargano out of the ring, but here comes Tommaso Ciampa! Ciampa nails Ricochet from behind with a forearm strike. Ciampa follows Ricochet out of the ring and he locks eyes with Gargano. Gargano ends up attacking Ricochet while he’s down, much to the delight of Ciampa. Aleister Black shows up and attacks the Champ. All four men fighting, until Gargano sends Ricochet into the steel steps. Gargano sees Black with the upper hand in the ring, and goes after Black! Gargano drops Black with a superkick. 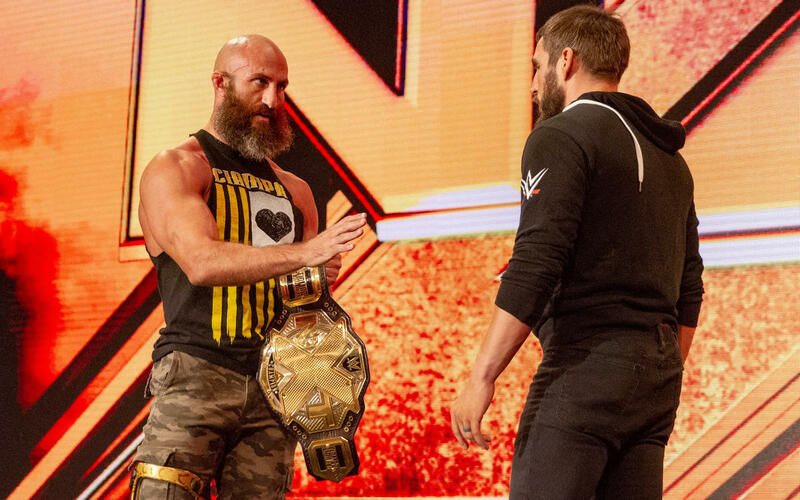 Gargano and Ciampa lock eyes again and now Ciampa attacks Black while he’s down. Ricochet tries to get back in the ring, but the former DIY members stay on the attack. Gargano nails his slingshot DDT on Ricochet, while Ciampa hits the Fairy Tale Ending on Black. Both men slowly leave the ringside from different sides of the ring but meet up at the ramp. They continue to stare at each other. They meet at the top of the stage. It almost looks like Ciampa wants to shake Gargano’s hand, but here comes Candice LaRae, who sprints in between them and says this isn’t going to happen. She can’t believe Gargano is actually considering it as she pushes him back towards the backstage area as our show comes to an end. K-Tank’s Take: Wow! What a hot finish to send us home for Takeover. Puts over both matches strong for Saturday, and now leaves the question of where does the former DIY stand now? Would either of them help the other on Saturday to get the title they’re either gunning for or trying to retain? Definitely adds a layer of intrigue, and I can’t wait to see how it plays out! That’s it for this week! 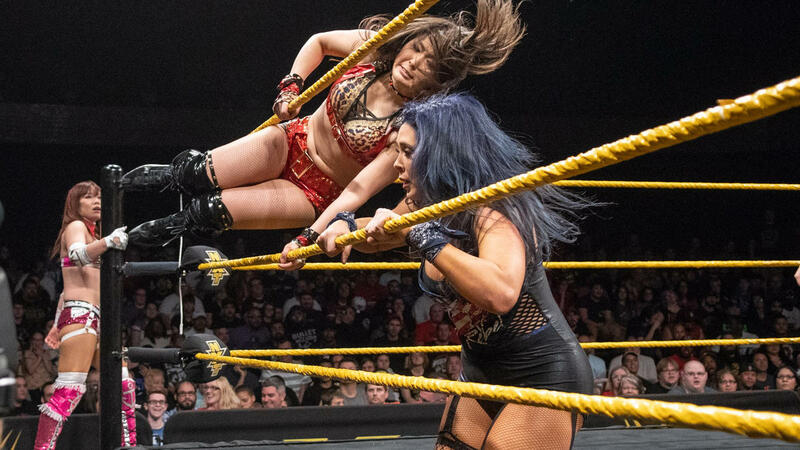 Once again, be sure to check out our official preview that I linked at the top of this page, and be sure to join me Saturday night for live coverage of NXT Takeover: Phoenix! You’re not going to want to miss it. Until next time, don’t do anything I wouldn’t do… but if you do, name it after me!